This feature includes a range of vegetation on blanket peat in the hills and uplands and raised bogs of the lowlands. Blanket bog and bog heather moor are the principal plant communities, with heather (Calluna vulgaris ), cotton-grasses (Eriphorum spp), deer-grass (Trichophorum cespitosum ), flying bent (Molinia caerulea ) and bog mosses (Sphagnum spp ) the predominant species. The eroded peat sub-category is extensive where high winds, frost and high rainfall are prevalent. Areas with dubh lochans (many small pools of open water) are widespread in Northern Scotland. 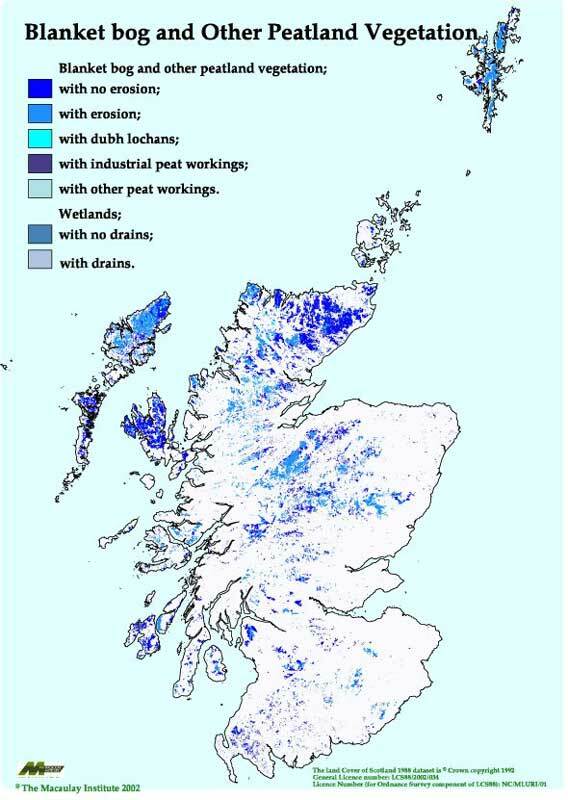 For further information on peat deposits surveyed by the Scottish Peat Committee  or Macaulay Institute, held by the James Hutton Institute, please see the page on Peat Surveys: Peat Deposits .